Western blot analysis of extracts from various tissues using ABCA7 Antibody (Mouse Specific) (upper) and β-Actin (D6A8) Rabbit mAb #8457 (lower). Immunoprecipitation of ABCA7 from mouse brain extracts. Lane 1 is 10% input, lane 2 is Normal Rabbit IgG #2729, and lane 3 is ABCA7 Antibody (Mouse Specific). 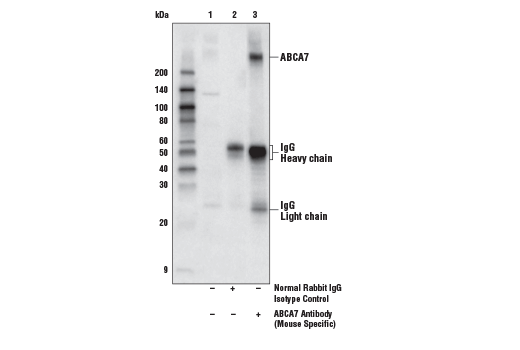 Western blot analysis was performed using ABCA7 Antibody (Mouse Specific). 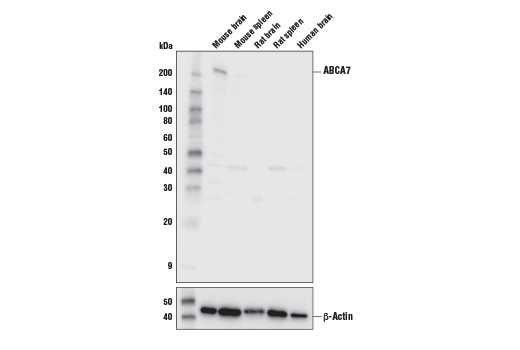 ABCA7 Antibody (Mouse Specific) recognizes endogenous levels of total mouse ABCA7 protein. Polyclonal antibodies are produced by immunizing animals with a synthetic peptide corresponding to residues surrounding Val2145 of mouse ABCA7 protein. Antibodies are purified by protein A and peptide affinity chromatography. ATP-binding cassette (ABC) proteins are membrane-residing transporters that transport substrates across the membrane in an ATP-dependent manner. ABC substrates subject to active transport across the membrane include ions, amino acids, lipids, and sterols (1). ATP-Binding cassette sub-family A member 7 (ABCA7) is a member of the ABC family and functions to regulate phospholipid and cholesterol homeostasis in central nervous system (CNS) as well as peripheral tissue. ABCA7, like most ABC transporters, contains two transmembrane domain bundles composed of six membrane-spanning helices and two nucleotide-binding domains. ABCA7 and its closest homolog, ABCA1, are 12A class members of ABCs and both proteins function to transport cholesterol and phospholipids in an apolipoprotein A (apoA) – dependent manner (2, 3). ABCA7 is expressed in a variety of tissue and exhibits neuronal and microglial enrichment in the CNS (4). Human genetic studies identified ABCA7 gene variants, including loss-of-function mutations, that associate with late-onset Alzheimer’s disease (AD) (5). ABCA7 dysfunction may contribute directly to AD pathogenesis by accelerating amyloid-β (Aβ) production and/or altering microglia-dependent phagocytosis of the Aβ (4, 6, 7). Higgins, C.F. (1992) Annu Rev Cell Biol 8, 67-113. Abe-Dohmae, S. et al. (2004) J Biol Chem 279, 604-11. Wang, N. et al. (2003) J Biol Chem 278, 42906-12. Pereira, C.D. et al. (2018) J Alzheimers Dis 61, 463-485. Sakae, N. et al. (2016) J Neurosci 36, 3848-59. Fu, Y. et al. (2016) J Alzheimers Dis 54, 569-84. Aikawa, T. et al. (2018) Brain Sci 8, .